This is the 6 Volt Optima Battery. 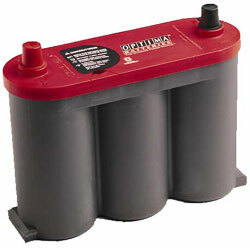 This red top starting battery has top mount battery posts in the OEM automotive configurations. OPTIMA?s unique design ELIMINATES battery terminal corrosion experienced with most other battery designs and construction. Most 6 volt batteries are poorly constructed and the battery cases leak, and The posts/cables are prone to corrosion. This is very frustrating and Damaging to vintage cars and equipment. This battery is great for most 6 volt automotive and agricultural applications. The 850/6 is the BEST CHOICE!